Love high impact lip colour, but not so fond of tightness, dryness and smudges? Provocalips 16HR Kissproof Lip Colour from Rimmel gives you stunning, true lip colour that’s completely kiss-proof and transfer-free! Plus, no tightness nor dehydration leaves lips feeling smooth and moisturised all day long. Want to try it for yourself? 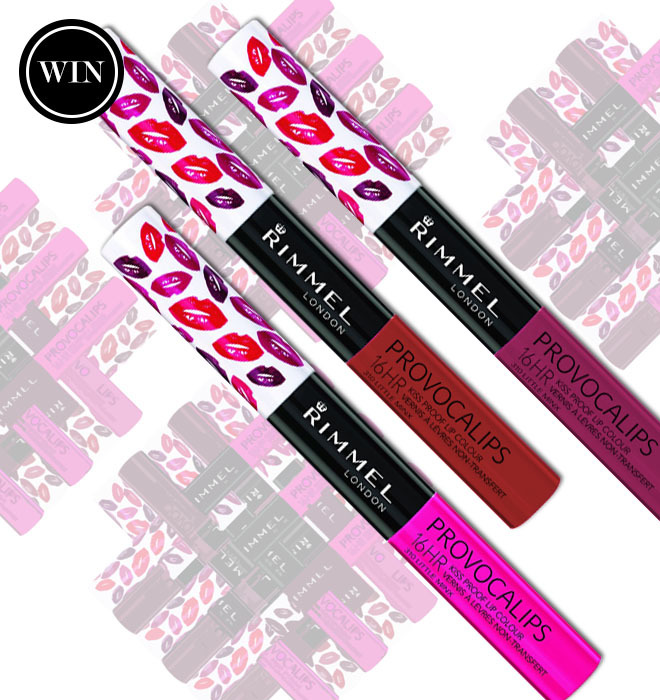 We are giving three Provocalips Lip Colours to one lucky reader! All you have to do to enter is answer the question below and submit your details. This competition is open to SA residents only and closes at 08:30am on 18 May 2015. You may enter as many times as you wish, if you would like to increase your chances of winning. The winners will be drawn from all the correct entrants and notified via email. This prize cannot be exchanged for cash. BeautySouthAfrica.com’s decision is final and no correspondence will be entered into. We will not share your information with any third parties. If winners do not respond to email notification within three days, another winner will be drawn. BeautySouthAfrica.com will supply all hampers to the delivery company in good order, but will not be held liable for the condition of hampers arriving at the winners’ chosen delivery address. Please allow six to eight weeks for delivery. If you have won a prize on BeautySouthAfrica.com in the last two months, you are ineligible to win this competition.